STT loves an eye-catching headline. Today’s is, on one level, the kind of spoof headline dished out by Washington pranksters, The Onion: so outrageous, that no sentient being could accept the premise. However, half of our headline is quite literally true: the wind industry has been putting out figures claiming that it is not only competitive with coal-fired power, it is actually cheaper (eg this piece put together by the CEC for SBS). ‘Competition’, in the wind industry’s eyes, is a pretty fluid concept: for most of life’s endeavours, it means a head-to-head race between all competitors, starting at the same time and traversing the same course, from start to finish. Not so with wind power. 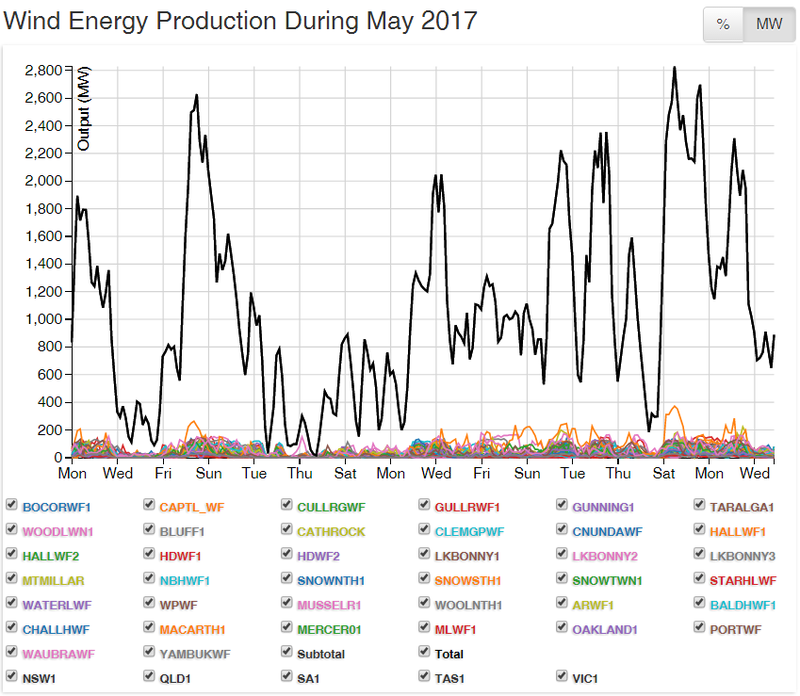 Depicted above is the output from every wind turbine connected to Australia’s Eastern Grid (with a notional capacity of 4,395MW) during May. Based on that ‘performance’, STT has a few questions for the Clean Energy Council and its wind industry clients; AGL, Infigen, etc, etc. c) never – it receives $3 billion a year in subsidies drawn from power consumers, which it uses to knock conventional generators out of the market, when the wind is blowing, destroying their profitability and the grid into the bargain. Then – as made plain in the second piece below – there is the fiction that wind power can be bought on days when breezes turn to zephyrs, and wind power output drops to a doughnut (see above). When the wind stops blowing (or blows too hard) wind power can’t be bought at any price. It was fictions, in the nature of the above, that found their way into Alan Finkel’s fantasy land review of Australia’s electricity market debacle. The greatest contribution the Finkel Review makes to Australian public policy may, in fact, be a new verb. From June 2017, to ‘finkel’ will be a term to describe how a government sets up an independent review that quickly gets hijacked by vested interests, rewrites its own terms of reference and delivers a report with skewed modelling and a patchwork of contradictory recommendations burning its political masters. It has all been too clever by half. The Finkel Review was set up in the wake of the September 2016 blackout in South Australia which many at the time thought would be the beginning of the end of renewables’ stranglehold on Australian policy makers – state and federal, Labor and Liberal. In the twenty-first century, an established state in a modern, industrialised economy went black. Finally, the chickens would come home to roost and a road map put together charting a way back to affordable and reliable electricity in a country that should be spoilt for choice. Yet the preliminary report published barely two months later gave some clues that the empire was quickly striking back. Its limited case study of the South Australian blackout all but ignored that state’s post-renewables reliance on brown coal electricity generated over 600 kilometres away in eastern Victoria. It also included a reference to a mind-boggling 21 separate reviews currently underway or recently completed into the Australian energy market, a fact that says much about the handballing epidemic currently prevalent in our political culture. So it shouldn’t have been a surprise when the final report, released on 9 June, offered more of the same. The difference was this time it had clearly over-stretched. It was revealed as a report that purported to be concerned with electricity affordability and security but floated a generator emissions limit at a level (600kg per megawatt hour) that would conveniently exclude almost all coal. This is despite the fact that Australia’s wholesale electricity price, largely provided by baseload coal supplemented by gas happily bounced along between $30 to $40 per megawatt hour between 2000 and 2006 before starting its rapid rise to a new benchmark of over $100 in 2017 as subsidized solar and wind power started pushing gas and coal out of the market. It was revealed as a report that purported to be concerned with emissions reduction but studiously avoided all but a passing reference to the one source that could provide reliable baseload power with zero emissions, namely nuclear power, despite Dr Finkel’s previous support. The IPA and others highlighted that the so-called $90 per household saving of the Clean Energy Target scheme was actually achieved by comparing it with the current, unsustainable, price-inflated mess of national and state renewable energy targets, agencies and funding mechanisms, rather than a genuine Business As Usual (i.e. no government interference) benchmark. The Review’s ham-fisted attempt to construct an edifice of rules, regulation, new reports and more powers for regulators to justify its acceptance of the inevitability of renewables came unstuck when it was revealed that the so-called $90 annual saving didn’t actually include the new target’s cost to retailers or the cost of back-up generators to balance the system and that the modelling firm had previously under-estimates renewables’ impact on wholesale prices. Most significantly perhaps, its call on federal and state governments to agree on an ‘emissions reduction trajectory’ and support for a zero emissions target in the second half of the century revealed its true priorities. The problem for the Finkel Review and for the many renewable energy advocates is that the rest of us have to live in the real world. And it is in this real world that last week, three major electricity retailers announced double-digit price increases to take effect from 1 July, with at least one of the companies openly sheeting the blame home to the increase in wholesale electricity prices. BP last week released its respected annual Statistical Review of World Energy, which found that non-hydro renewables provided only 3.2 per cent of the world’s energy in 2016, or a little over 11 days’ worth. And renewables advocacy group Bloomberg New Energy Finance reported that the global push for renewables would cost $7.4 trillion between 2016 and 2040, though an additional $5.3 trillion would be needed to hold the planet to a two-degree warming trajectory. Danish statistician Bjorn Lomborg got it right in 2015 when he said that “When the wind is not blowing, wind-generated electricity is the most expensive electricity of all because it cannot be bought at any price,” a point equally applicable to other weather-dependent renewables like solar and hydro. Time is fast running out for Australia to renew its ageing energy infrastructure before major pieces of its industrial base move offshore and even more households succumb to skyrocketing power bills. The Turnbull Government should politely thank the Finkel Review members for their work and politely put their report into the cupboard alongside the cardigans, frisbees and cassette tape recorders whose existence is acknowledged but whose absence from active use is unlamented. In the next helpful piece, the IPA provides answers to the rhetorical questions posed by STT above, as well as some pertinent posers of their own. 1. Is the cost of electricity in Australia from renewables really cheaper than electricity from coal? Prior to 2007, average wholesale electricity prices in the National Electricity Market ranged between $30 to $40 per megawatt hour. So far in 2017, after a sevenfold increase in solar and wind power under the Renewable Energy Target, wholesale prices are ranging between $65 to $108 per megawatt hour with futures prices consistently higher. 2. If, renewables are cheaper than coal and gas, why does renewable energy need to be subsidised through measures such as the renewable energy target? 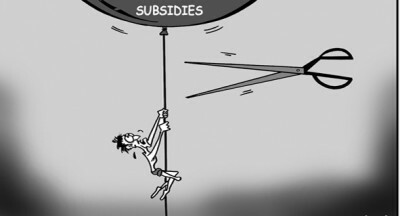 The apparent competitiveness of renewables is only a product of subsidies and government intervention, recently estimated as being worth $3 billion per year in 2015-16. If renewables are already cheaper than fossil fuel as its supporters claim, then let’s remove all federal and state government programs and agencies that support renewable energy development and generation. 3. The Finkel Review refers a number of times to a “Business As Usual” scenario. What is it? It is a straw man. Dr Finkel claims that electricity prices will be $90 per year cheaper under the proposed Clean Energy Target against the so-called Business As Usual scenario. However, Business As Usual is not an Australia with the secure and affordable electricity system it once had. It is an Australia with prices inflated by a Renewable Energy Target, Australian Renewable Energy Agency, Clean Energy Finance Corporation, state energy targets and other government and regulator policies stifling internationally competitive gas and coal generation resources. The cost impact on electricity bills of a Clean Energy Target (or Emissions Intensity Scheme) should be judged against a Business As Usual scenario where all energy technologies, including coal, gas and nuclear are able to compete in an open market. 4. What is the practical effect of the apparent 600 kilograms per megawatt hour generator benchmark? Given that the origin of the proposed Clean Energy Target benchmark of 600 kilograms of CO2 per megawatt hour is unclear, parliamentarians should carefully examine the yet-to-be released modelling behind it. This benchmark would punish almost all coal-fired power generation, and force even more renewables into the National Electricity Market. If an emissions benchmark is to be set for current or new generators in the market, it should be set at a level that would allow all fuel technologies to compete, for example 800 kg/MWh for black coal and 900 kg/MWh for brown coal. 5. Will there still be an energy market if the Finkel Review is implemented? The Review’s recommendations included new ‘Energy Security and Generator Reliability Obligations’, an agreed federal/state ‘emissions reduction trajectory,’ Health of the National Electricity Market report, assessment of resilience to human and environmental threats, integrated grid plan, options for subsidised funding mechanisms for low income access to energy efficient appliances, rooftop solar and battery systems, more powers for the Australian Energy Market Operator and a new, overarching Energy Security Board. The Review also recommends banning generators from closing unless they first give regulators three years’ notice. The system is on the verge of a return to the command and control ethos that the national electricity market replaced, but in the twenty-first century the commanders will not be the engineers like Sir John Monash in Victoria who were committed to building a reliable and competitive electricity network. Its commanders will be national-level policy makers committed to transitioning to a zero emissions economy. The report noted that a ‘stable policy environment’ was required for industry confidence and to plan for the future. However, if the point of this review was to establish a basis for a bipartisan approach to energy policy, that hurdle fell even before the report was released. On 6 June Shadow Environment Minister Mark Butler promised support conditional on a new scheme being able to be ‘scaled up in the future’ – an undertaking repeated on a number of occasions the following week and on the morning of the Report’s release, Victorian Premier Daniel Andrews also refused to abandon that state’s own 40 per cent Renewable Energy Target Effective policy is more important than so-called bipartisan policy. AGL & Co are playing a very dangerous game: constantly advertising their claim that wind power is cheaper than coal-fired power, and getting cheaper all the time, leaves them wide open. Taken at their word, there clearly is no need for any more renewable energy certificates, mandated targets or mandated fines imposed on retailers for not taking wind power. Given the mood in the Liberal/National Coalition partyroom, the wind industry might be met with news, congratulating it on being able to compete, unaided, with conventional generators; and giving it an opportunity to finally do so, in a true head-to-head with coal-fired power plant. The Coalition could give them that opportunity by stripping away all of those dreadful impediments and obstacles to fair and open competition amongst power generators; such as the Large-Scale RET, RECs and the shortfall charge – on the wind industry’s current case, impediments which are clearly no longer necessary. Then Australia can sit back and watch its wind industry flourish: providing free or nearly free electricity to every home and business 24 x 365, without so much as a sniff of subsidy, or any need for mandates or fines on retailers to take their product. What’s that adage about the need to be careful what you wish for? If AGL and Australia’s other insatiable renewables rent-seekers keep pontificating about their ability to not only compete with, but beat, conventional generators, they may very well get the thing they fear most: real competition. Not only are windmills heavily subsidized, but worse than that the red-green countries in the West are using taxpayer’s money to buy a steady stream of useless, expensive windmills (and solar panels). This planned economy based on ideology and smart private profiteers, like Vestas, are getting super-rich. Looking at the graph of Wind nonsense output. To place it into perspective, Eraring power station in NSW is 2800 MW 24/7 and Liddell power station in NSW has 2400 MW all 24/7. AGL is planning on closure of Liddell in 2022 but inside information predicts this will be sooner and also predicts Eraring will also close before then. With AGL advertising they are “getting out of coal” the future for electricity generation in NSW is bleak. Those Politicians that believe that we can run on wind obviously don’t live next to a wind farm. Our useless one next door has been producing next to nothing for the past weeks, sometimes starting and stopping up to 3 and sometimes 4 times in on day. Now that’s what you call a stable supply. Oh, I forgot, during the time the wind isn’t blowing they are drawing electricity from the grid to turn them over. Visitors are dismayed, stating they are supposed to make electricity not use it. Hallo from Denmark! This is a great mistake! Windpower has one big problem: It will not produce electricity, when there is no wind !!!! Even if you will build hundred times more windpower, they will not produce power, when the weather is beautiful !!! – Then you must get power from stabile sources. In Denmark we are very glad, because we can buy electricity from our neighbouring countries. “AGL & Co are playing a very dangerous game: constantly advertising their claim that wind power is cheaper than coal-fired power, and getting cheaper all the time, leaves them wide open. Keep up the rhetoric AGL, Infigen et al… let’s see how long you last on the real market against real competition. Infigen has just accepted the lack of wind has cost them dearly – again – causing their shares to take a dive. No they don’t like the truth, but this Month of June they are going to feel it even more. Wind was all but absent for most of yesterday across the grid, and completely absent in SA and Victoria for long periods. Further today Bruce Mountain (RenewEconomy) has just stated to Leon Byner on 5aa radio station in SA that SA now has the highest energy prices in the WORLD. And which State has the most MW of wind turbines SA of course. No matter how they ‘coat’ it Wind energy is to blame. A plastics recycling company after 38 years of business is closing down in SA as their power bill went from $80,000 per month to $180,000. Nothing more than abandoning the RET and other handouts and favours to the wind industry thereby creating a level playing field will resolve this situation and it is going to spread unless the Federal and State Governments encourage clean coal or some for of nuclear energy production. It is obvious wind or other weather dependent methods of production cannot provide what this nation needs to survive. We have to acknowledge when the economics of a nation fail there is going to be major social turmoil, with all that brings. Australia is on the brink and needs strong Governance that has the nation and its people in clear focus. Governments and Producers are there to serve the people, without the peoples support they will fail. Producers will fail because people will not be able to afford what they produce and Governments fail because they will have failed the people. I sent a question to ABC Factcheck after the CEC claimed wind was $53 per mwh to find out if this included REC and, no surprises, they didn’t bother to respond. As I say in Victoria, with our so called smart meters they can individually turn supplies off to renewable supporters so they only get renewable power, so on hot or colder days the rest of us can keep a normal lifestyle going. If there is as much support as they claim, only half of them would lose power anyway. Tom, the figure is in addition to the REC, currently worth $76, so the power cost is $129 per MWh to the retailer, who will add 7-10% and it also ignores the network cost of getting the power from the back of beyond. All renewables do is push societies out of the fossil-fueled Industrial Age and back to the renewables-only Middle Ages, when energy was expensive and people couldn’t afford to use much of it. The only way to retain a modern lifestyle without fossil fuels is to man-up and move forward to the bright and wonderful Nuclear Age.